I was referred by one of my tennis partners to try the Snake-bite string and I was surprised how durable it is and of course the extra spin potential from the string cross section pattern. I also like the golden set overgrip because of its particularly tackiness. Finally, you can’t beat the price of the Golden Set products which is very competitive. I am sold on their products. I am thoroughly satisfied with the over wrap for my tennis racquet , it's the only one I use, good product at a reasonable price. 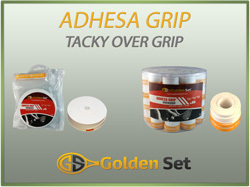 I highly recommend Adhesa Grip for anyone seeking a comparable tacky overgrip that is well-manufactured and available at such attractive price points. I got the 15-grip reel of Adhesa for the first time a few days ago, and was immediately impressed with the similarities to other white tacky overgrips on the market. The feel and durability of Adhesa is slightly better than other similar grips. What always bugged me about other brands' 15-grip tacky reels is how they roll them so that each grip overlaps with the next one, such that you have to find the end of the one you want, peel the plastic from the overlap, and then reapply the plastic to the next grip before storing it back in the pouch for the next one. Thankfully, Adhesa is made so that each grip separates cleanly from the next...I know, it's a small and simple thing, but it's a significant factor if you need to quickly change grips during a changeover, or you're just tired of playing hide-and-seek with the ends of your overgrips on the reel, which in my opinion is easier to carry in a racquet bag than the individually rolled ones. The Adhesa Tacky White Overgrip is by far the best over grip I have ever used, and is the only over grip I will use. On top of that, buying them in the bin of 60 is brilliant value. The grip is super tacky and lasts for many hours before I feel I want to replace it. I sweat a lot, but the grip manages to do something with the sweat, as my racquet never slips in my hand. I have shared the grips with many other people, and they too prefer this grip over anything else. With all honesty and sincerity, this is a brilliant over grip. If you like tacky and long lasting then this is the grip you should use. I'm a TPA certified Club Professional 1 and also an avid player. I am on court 3-4 days/week and I go through a substantial number of overrips yearly. A couple of years ago I came across Golden Set overgrips and I've been buying them in bulk ever since. It is by far one of the best overgrips I've ever used. They last a long time and even when they get completely grey (I use the white ones) the tackynes is still there. I highly recommend this product to everyone who's particular about their overgrips. I am a great fan of the adhesa grips which are of excellent quality, durability and value. I highly recommend this product as a superior overgrip. Great grips. Great snake-bite string. Great dampeners. Great service. I will never buy tennis gear from anywhere else. For the price, the Golden Set Tacky grips are unbeatable. During the cooler months I switch to these, because they have a great feel when the air is dry. For summer time, I use the other type offered by Golden Set. Purchased Adhesa tacky overgrip and found it to be very comfortable and tackier than other brands, which shall remain nameless, which I recently purchased. Strongly recommend this overgrip for anyone with dry hands. I go through a lot of them so it was great because I ordered the package ones. I chose this grip because it got very good customer's reviews. I bought a couple of packs of 15, however, after I tried several of the grips, I regret I did that. This grip, as it says, it is "tachy" and actually it is too tachy that it hurts my palm every time I change a new one. I caused blisters of my palm even my hands are pretty rough after I played tennis so many years. This is the best grip in durability, comfort, & tackiness that I've ever used over the past 10+ years of playing tennis. I tend to not to tell my friends about this, b/c I truly believe there's a slight competitive advantage over the other big brand name grips. If you don't believe me, try it!